Being a self-proclaimed plant & whole-food lover, my husband has become quite terrified that I’m trying to turn him into a vegan (seriously, sometimes he has nightmares about tofu). So, in an attempt to quell his fears I thought I would kickstart the blog with his favourite meal; because who doesn’t love a good roast chicken? 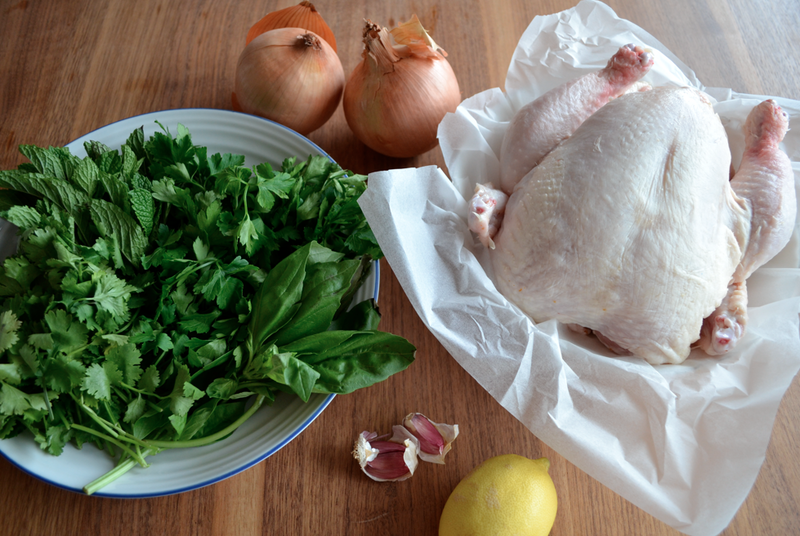 I’ve always felt that the perfect roast chicken is a prerequisite for any successful home-cook & being staple fayre at every Jewish sabbath dinner it’s kinda’ handy to have a fail-safe (& not to mention easy) recipe tucked up your sleeve! With its lemony sharpness & mellow combination of herbs this marinade brings new meaning to the words ‘winner winner chicken dinner’ so, go on, give it a shot & report back. Feeds 4 but this recipe yields enough marinade for 2 chickens. 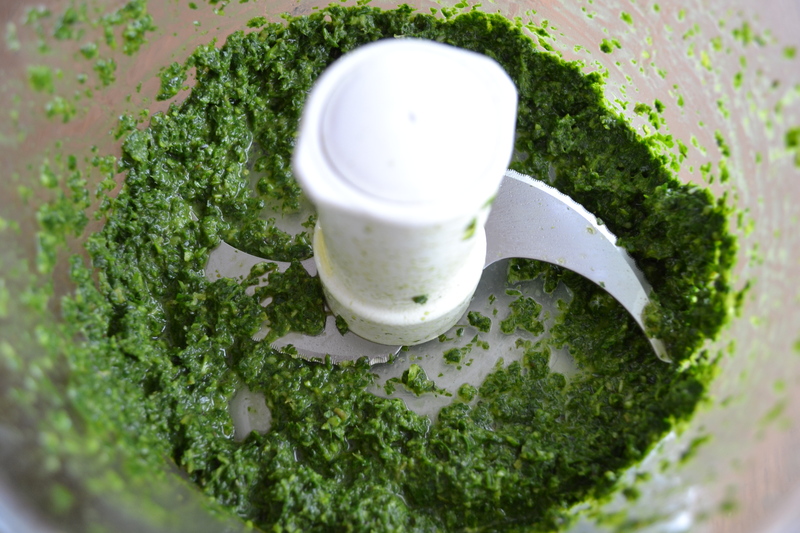 To make the marinade, simply whizz together the garlic, herbs, lemon juice & zest & the extra virgin olive oil in a food processor to form a vibrant pesto-like paste. Add salt & pepper to flavour et voila – it really is that easy. Place the sliced onions into your roasting pan & toss in a little oil. Sit the chicken on top of them & massage all over with the marinade. Make sure to get some underneath the skin on the breast (this helps to stop the white meat drying out in the oven). This is best prepared the night before so the flavours can develop but if you’ve no time then fear not – I can guarantee it will still taste fabulous. The chicken will need approximately 1.5hrs at 180°. Don’t forget that the onions will soak up all the sumptuous cooking juices – I always spoon some over the chicken when serving. DRY YOUR CHICKEN // once you’ve cleaned & prepared your chicken make sure to pat it dry. If your chicken is waterlogged it will more likely spend time steaming than turning lovely & golden. WASTE NOT, WANT NOT // I always stuff the chicken cavity with the used lemon halves to draw out even more flavour during cooking. If you ever have leftovers – and that’s a BIG if – pop the cooked lemon halves in with them as they manage to infuse the cooked chicken with even more lemony goodness. THE BIG FREEZE // It’s always handy to have a little gem like this ready-prepared. This marinade freezes so well & loses no flavour. I often make the above recipe and freeze half for the next time. Thanks for the great recipe! Planning to give it a go next week. Wow! Amazing format. Lovely enticing photos. Will try chicken this wknd. Thanks Yael – I hope you enjoy it! Oh this sounds great, my in-laws are over this weekend so will give this a try. Thanks.